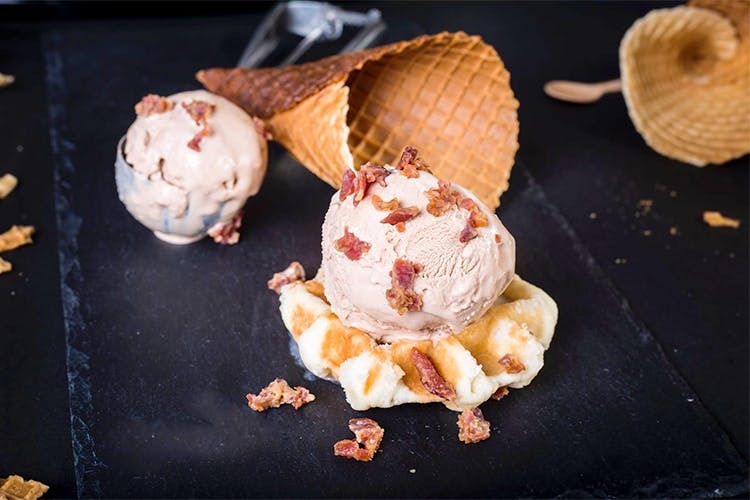 Bono Boutique Ice-Cream, a dessert parlour with a cheeky twist is soon opening its second outlet in South Bombay, and obviously we’ve got the scoop. A boutique ice-cream parlour, Bono has been running successfully in Bandra for a year now, and is soon going to occupy a spot at Kemps Corner. This brand is handled by a sister duo that makes stunning, hand-churned ice-creams with no compromise on quality. They have 10 flavours on the menu, ranging from classic to some you’ve never heard of. Apart from the expected hazelnut, salted caramel and maybe even the mango-passion fruit, these guys have brought milk chocolate, bacon and blue cheese honey into people’s lives. If you’re still holding on to that truffle-in- everything trend, you must try their dark chocolate Italian truffle oil ice-cream too. The flavours start at INR 180 for 125ml and the big 500ml tub will do a damage of about INR 675 to your wallet and your self control. Be excited, SoBo people. We definitely are. The dates aren’t final yet but the shop should open around August 20.